As the tallest skyscraper in downtown Denver, Republic Plaza rises 728 feet and 56 floors into the nighttime skyline. Just beneath that height is the CenturyLink Tower at 709 feet. The Cash Register, also known formally as the Wells Fargo Center, comes in at 698 feet. In the foreground is the Speer Boulevard Bridge. 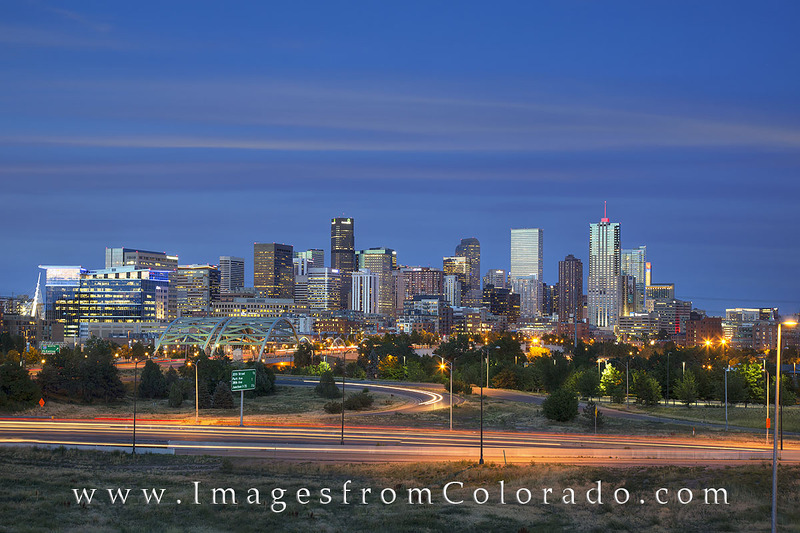 Denver is an entertaining city with a nice skyline, great for exploring as a local or tourist. Republic Plaza is the tallest skyscraper in the Denver Skyline at 728 feet and 56 floors. Nearly as tall in the Denver cityscape is the CenturyLink Tower at 709 feet. The Wells Fargo Center, nicknamed the Cash Register because of its unique top, also stands tall at a698 feet. In the foreground is the Speer Boulevard Bridge. This Denver Skyline picture was captured from west of downtown Denver and looks westward. Photo © copyright by Rob Greebon.